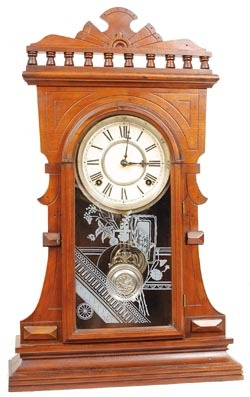 Waterbury Clock Co. solid walnut mantle clock, "Murray", ca 1891. This clock makes a statement. It isnt the fanciest one in this catalog, butit is clean, original, well proportioned, and running. We will forgive Papawfor covering the old dial paint. It was no doubt dirty and he wanted thedial to be clean like everything else. The door glass is perfect. If it werentan original Waterbury glass and shown throughout their catalog, you mightthink it to, was replaced. 8 day, half hour cathedral bell strike. This clockis ready, to sell, give away as a gift, or put on your mantle. Ly-Waterbury No. 1592.